Universal Pictures is finally getting their shared Monsters Universe off the ground, as production begins on the Untitled Mummy Reboot. While the title creature is nowhere to be found, the first set photos have leaked. Tom Cruise and Annabelle Wallis are currently shooting in Oxford, England. We don't know what's going on in these first images, but it appears that the actor and his leading lady have had a particularly tough night. This is our first unofficial look at the movie's two heroes in what is being called a contemporary adventure. Sofia Boutella is also starring in the movie, playing the lead villain. This will be the first time a female has ever played the role of The Mummy in Universal's long and storied franchise. The story takes place in modern day. 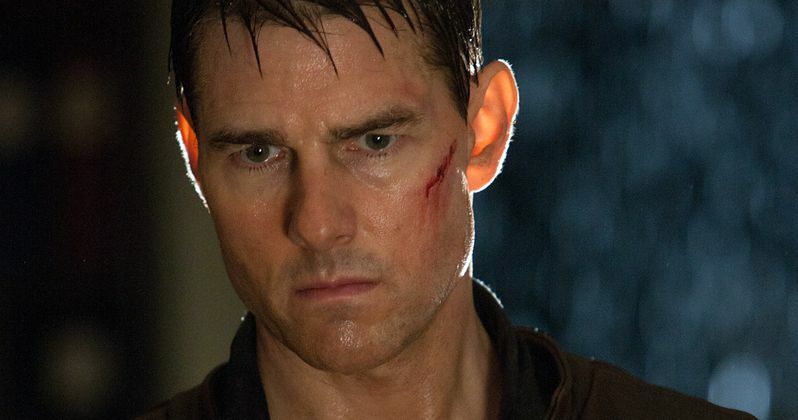 Tom Cruise stars as a former special forces officer. Annabelle Wallis is said to be playing a scientist, though her initial casting announcement claimed she was playing an archeologist. Back in early March, it was announced that Jurassic World co-star Jake Johnson is playing a role that was specifically written for him, starring as a member of the military with ties to Tom Cruise's unnamed character. He will be the comedic relief. Alex Kurtzman is directing the Untitled Mummy Reboot. He will be working from a script by Jon Spaihts. Chris Morgan and Sean Daniel are producing this action-adventure thriller, which is said to incorporate more horror elements than the previous The Mummy franchise which kicked off in 1999 and starred Brendan Fraser and Rachel Weisz. The Untitled Mummy Reboot will be the first movie in the studio's new Monster Universe that is set entirely in present day. It follows 2014's Dracula Untold, which ended with a prologue that brought its vampire into present day as part of this sprawling cinematic universe. Previous reports about Universal's Untitled Mummy Reboot claimed that the movie centers on Navy SEALS in Iraq. These latest reports indicate that the military will definitely be involved in the plot. But there is no confirmation of where the action all takes place. Johnny Depp will star in the studio's reboot of The Invisible Man, which is being developed along with several other projects such as Van Helsing, The Bride of Frankenstein and The Wolfman as part of Universal's Monsters Universe. You can take a look at the first images to arrive from the set of this thriller as shooting continues throughout this weekend in Oxford, England. What do you think? Are these the two weirdos you want protecting us from The Mummy?